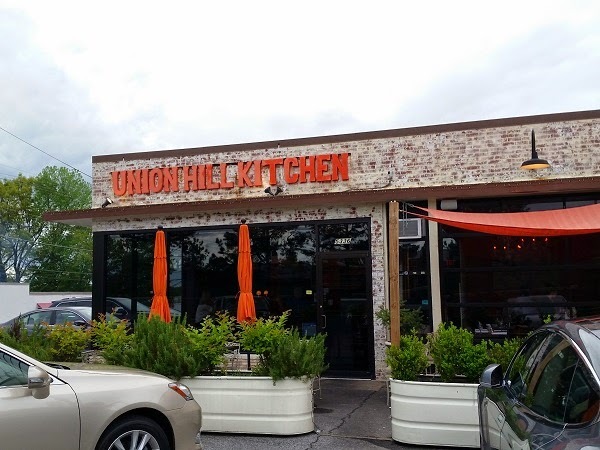 Union Hill Kitchen, Chamblee GA – Marie, Let's Eat! Back in April, Marie and I, along with the then-three year-old, went looking to get into trouble with Sandy from Bella Vivere, and decided that maybe just going out to eat would be more sensible than starting a riot or something. She suggested Union Hill Kitchen, and we met there for a rather good dinner. Executive Chef Alexis Hernandez grew up in Hudson County, New Jersey, and named the restaurant after his high school. It opened in October 2013 and has not received a particularly loud buzz or hype from the hobbyist crowd, and user reviews at the usual sites have been decidedly mixed, but we were all quite pleased with our meals and really enjoyed the playful menu, terrific service, and good food. I’ve been wondering recently about why bloggers at least appear to (painting in broad, broad strokes with this claim here, friends) write more positive stories than the lower ratings on Yelp or Trip Advisor seem to suggest. I’d like to think one reason is that most of us who write blogs don’t wish to write negative stories in the first place; we tend to want to write because we’re sharing stories of meals that we enjoyed and, even if the experience was a little subpar, we still want to encourage the restaurant to do better and for visitors to give places a try. Otherwise, we’d rather not bother writing anything. Again, broad brush, but I think most of our friends and peers in this hobby don’t typically give a place a big, public, thumbs-down based on one experience, and don’t turn both barrels on a place in a bitter Urbanspoon/Zomato review because of a service hiccup. Marie was baffled when I told her after our meal that the Urbanspoon rating was a low 68%. 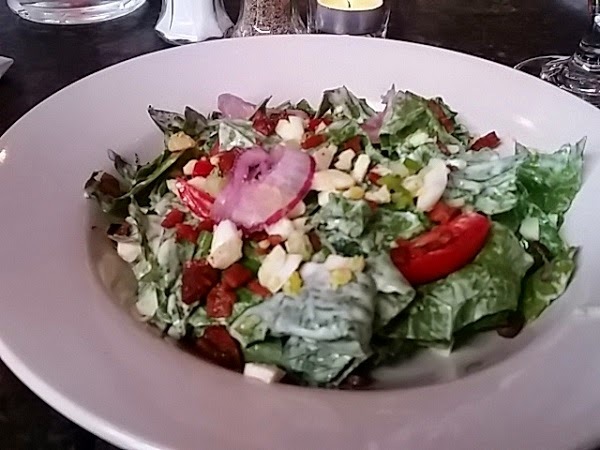 The food and the service that we received was all first-rate, and we’d happily come again. Our son was being very well-behaved, but also very unpredictable. We ordered him a side of broccoli, and he ate a little of it, but he was more interested in the fries that came with my “Hudson chicken” sandwich. Chef Alexis came out to say hello to us, and offered to sprinkle a few shallots over our son’s dish. He gamely tried a bite, but wasn’t taken with it. I’m glad he made the effort, though! The sandwich was really good. I like the “Hudson” breading; it’s very tasty. 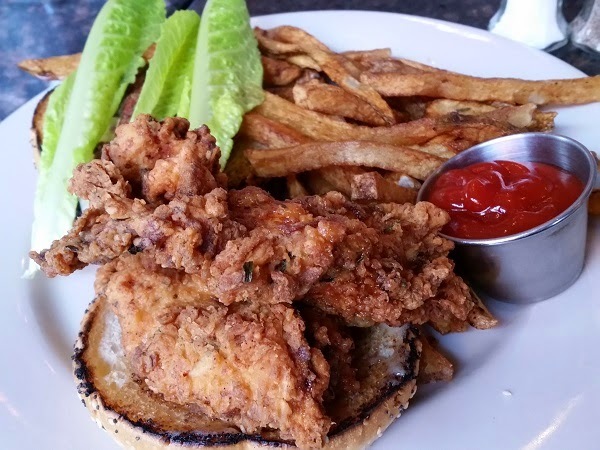 The sandwich comes with two chicken breasts, sort of his take on a double-patty burger. Sandy had a chorizo burger, which reminded me of the awesome chorizo burgers that we enjoyed at a dearly-missed place in Woodstock called Bob-O’s, which closed before we started the blog. 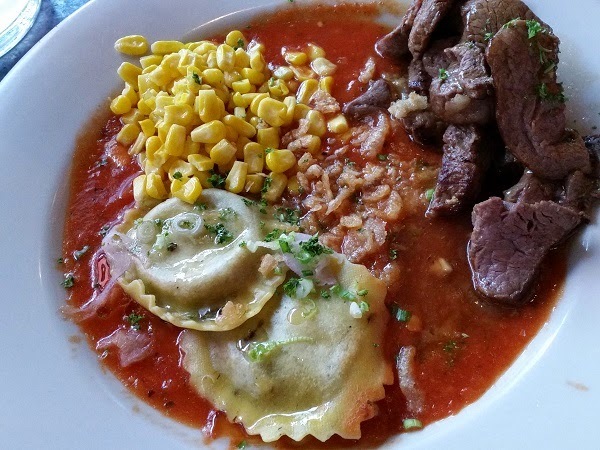 Marie said that the beef bourguignon was very good, but the standout in her entree was the ravioli, which was completely delicious. Union Hill is located on “proper” Peachtree Road, the arm that winds through Chamblee and all the antique places while the road that came up from Lenox and Brookhaven becomes Peachtree Industrial. This part of Chamblee has been crying out for better restaurants and shops for quite a few years, and Union Hill Kitchen, along with another new restaurant, Southbound, which has a not-dissimilar modern American menu, a few doors up the street, seems to be bringing some new life to the corridor. It’s certainly worth a visit. Posted on June 4, 2015 August 21, 2017 by Grant G.Posted in atlanta, chicken, georgia, modern americanTagged atlanta, chamblee, chicken, georgia, modern american. Good to know it’s gotten better. I had read that when it first opened it was plagued with the usual issues any start up has, so we waited to go. This is actually one of my favorite restaurants. I’ve never got a sandwich there but I absolutely love all of their entrees. I have had a lamb shank and a seafood pasta that were just two of the best dishes I have ever tried. Their wine is also really great as well. The owners friend actually flew to South America to get some of the wines we tried. He actually let us taste several for free and the chef gave us a free appetizer he wanted us to try as well. It was one of my best restaurant experiences. Wow! That’s high praise indeed. We’ll definitely get back there again sometime soon. Thanks for writing.